The Residenz Seeblick is a modern, bath-style renovated apartment house right on the Baltic Sea. Only 50 meters to the beach of Sellin and to the pier, the symbol of Sellin speak for itself. In the house is the reception, where you will receive your keys. The apartment is accessible by a lift. All apartments have a large balcony. WLAN Internet access is of course. The apartment is modern equipped and has a well equipped kitchen with dishwasher. Washing machine and dryer as well as garaging for your bikes are in the house. A free parking space is located at the house. We deliver the breakfast rolls from April until the end of October in the morning. 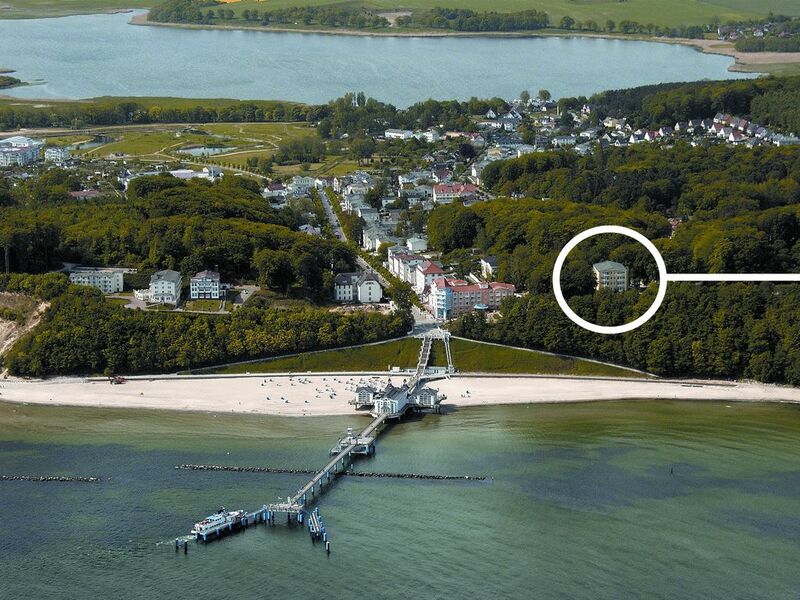 The Ostseebad Sellin is located in the southeastern part of the island of Rügen and has about 2,600 inhabitants. Sellin has been one of the best-known seaside resorts since the turn of the century. It owes its popularity as a bathing and health resort u. a. his so favored by nature location between the Baltic Sea and the Selliner See, with access to the Greifswalder Bodden. The magnificent villas and guest houses along the Wilhelmstraße date back to the heyday of this Osteebad. Many of them have been restored with great attention to detail in recent years. The neat, small seaside resort Sellin is located in the Granitz, the picturesque, wooded coastal landscape in the southeast of Ruegen, between the seaside resorts Binz (10 km) and Göhren (8 miles). The place shines today The beach, with its rebuilt, true to the original pier - affectionately called 'sky ladder' - forms the northern end of a wide, fine sandy bay (Strandkorbvermietung, nudist areas) overlooking the wooded cliff. In den Sommerferien ist die Wohnung erst ab 7 Übernachtungen mietbar.